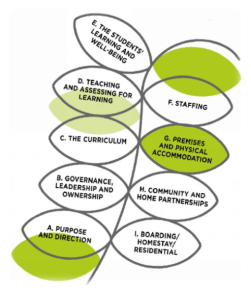 PURPOSE & DIRECTION – the implementation of the mission, vision and values, including the development of global citizenship, as defined by the school. STUDENT LEARNING – the nature and quality of learning and the resulting progress made by the students. STUDENT WELL-BEING – their protection, safety, security and overall wellness. THE DEVELOPMENT OF GLOBAL CITIZENSHIP – as defined by the CIS mission and definition of global citizenship. This committee ensures the socio-emotional wellbeing of the students and staff. It works with various external expertises who educate the faculties with necessary orientation on child safety. We create safe and supportive environment where the physical, emotional integrity and safety of each member is a matter of high priority. Health camps are conducted for the Children and the staff to ensure their well being. We concentrate on the child’s safety in all spheres- classroom, campus and outbound campus. We believe that being a global citizen goes well beyond simply traveling around the globe or living an expatriate lifestyle; it refers to a more holistic view of the world, understanding the commonalities we share and recognizing our responsibility to help our fellow man , safeguard our planet’s future and march towards sustainable development. QMIS with the objective on continuous improvement and to bench mark its practices to global standards ,works collaboratively with CIS since 2016 and shapes international education by connecting ideas, cultures, and educators from every corner of the world. This evaluates all aspects of QMIS’s educational strategies to discover new ways to live our goals and develop interculturally. As the first phase, upon conforming its standards with the expectations set by CIS over eight domains (excluding the standards for boarding) , QMIS received its membership in the year 2017 and is now geared up with the next phase of CIS accreditation process. With this membership accolade, QMIS becomes one among 25 schools in India and 4 schools in Tamilnadu and the only CBSE school in the world to get this premier laurel. Since its collaboration with CIS, QMIS has started relooking all its practices through the lens of “Global citizenship and Student well being”. To emphasize them strongly, exclusive working group has been created to spear head the above domains.